This is a scan of the original and unique artwork produced by Ann Quigley (of Factory Bands The Swamp Children and Kalima) for this gig at Bowdon Vale Youth Club. It was hand painted on card (800x545mm), and hung either on the window by the entrance, or near the door on the night. 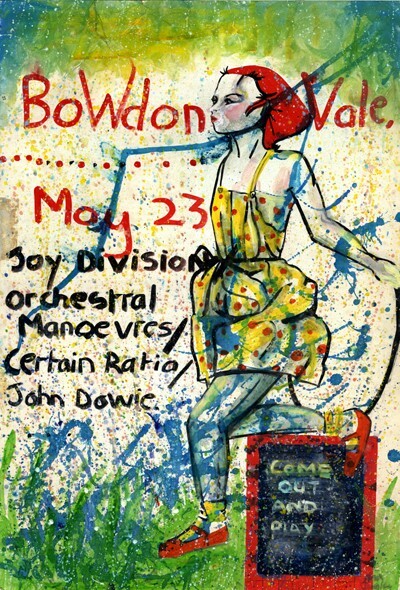 From Ann: "I remember the Bowdon Vale poster was a rush job, a last minute thing, done on the day, or the day before. Simon Topping from ACR asked me to do it, I was at the time doing a lot of artwork for ACR, Eric Random, and The Swamp Children." According to the JD Central site the Joy Division setlist remains unknown, though they allegedly played 'The Kill' (as per 'Still') on one of its only live appearances. Also OMD apparently pulled out. This is a seriously nice piece of artwork and i imagine the original is worth a fair amount of money.....did ann do any more ? More of this one? No, there is only one. Ann also did the artwork for the ACR album 'To Each...', plus various Swamp Children sleeves. Like it! Good stuff !